It is well known that the good nutrition during pregnancy is important for the growth and development of the baby and for fetal programming. 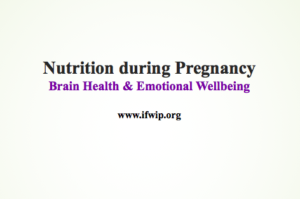 During pregnancy (and beyond), a healthy balanced diet (along with necessary nutritional supplements) is also important for good brain health and emotional wellbeing. Nutritional neuroscience is an emerging topic to explore how mental health disorders can develop due to nutritional factors. This article briefly outlines the role of nutrition for brain health, with special reference to pregnancy. Nutrients are vital for the function of the brain. To understand the role of the nutrition in the brain functions, it would be useful to discuss some basic neurophysiology. Neurotransmitters are also called the body’s chemical messengers. They are released from the end of the nerve cells to carry a nerve signal to the next nerve cell, muscle or any other structure. A group of neurotransmitters, called ‘monoamine neurotransmitters’, plays a vital role in the mood and wellbeing of the individual. There are three main neurotransmitters in this group: Serotonin, Noradrenaline, and Dopamine. Mood disorders such as depression are associated with the deficiency or inadequate functioning of these neurotransmitters. Serotonin is also important for memory, sleep, mood, and many different cognitive functions. Cell membranes ensure a balance of chemical signals entering into the cells, like a gatekeeper. If the cell membranes do not function well, then the nerve cells become too permeable to the external chemicals. Therefore, they become very excitable, which can lead to mental health conditions and neurological illnesses. Let us now consider which specific nutrients are required to carry out the above functions. 1. Amino acids: these are the building blocks of the proteins. Proteins in the diet, therefore, supply the amino acids. Some of the amino acids need to be supplied from the diet (as the body is unable to synthesise them). They are called essential amino acids. Some important amino acids essential for the synthesis of neurotransmitters are Tryptophan, Tyrosine, and Methionine. How do these nutrients maintain a good brain health? The amino acid Homocysteine would require Folic acid and Vitamin B12 to change to methionine. Methionine then changes to S-Adenosyl Methionine (SAM). SAM is essential for the synthesis of monoamine neurotransmitters (Serotonin, Dopamine, and Nor-adrenaline) in the brain. Vitamin B12 and Folic Acid supplementations have been shown to improve depression symptoms when used with antidepressants (when the initial response with SSRIs was poor). It is also an important component of numerous enzymes of the body. The balance and the ratio of copper to zinc are more important for health than the concentration of either of these minerals. Raised copper level and reduced Zinc level is one of the most common micronutrient imbalances in the human body. This has been found in many health conditions, such as schizophrenia, depression, insomnia, autism, childhood hyperactivity, hypertension, fatigue, muscle and joint pain, headaches, and premenstrual syndrome. The magnesium prevents the entry of calcium in the nerve cells (therefore, acts as a ‘natural calcium channel blocker’). Calcium is known to excite the nerve cells. Therefore, magnesium has a calming effect on the nerve cells and the brain. Magnesium deficiency can be caused by eating a diet less in magnesium or high in calcium and high level of stress hormones. Magnesium supplement has been found to be effective in the treatment of depression. Iron is a co-factor for some enzymes required for the synthesis of monoamine neurotransmitters, mainly serotonin, and dopamine. For adequate myelination of white matter cerebellar folds and spinal cord, a good supply of iron is required. Iron deficiency anaemia is very common during pregnancy. Low selenium is known to increase the risk of preeclampsia and pregnancy-induced hypertension. Studies have indicated that selenium supplementation might be able to prevent postnatal depression However, more research is required in this area. Dietary supply is required as the biosynthesis of choline is not enough to meet the increased requirement during pregnancy. Rich source of choline are eggs, liver, chicken, fish, legumes, cruciferous vegetables, milk, and soya products. Vitamin D (also called the sunshine Vitamin) is produced in the skin with the exposure to ultraviolet rays from the sun. Vitamin D, once produced in the skin, undergoes further changes (‘hydroxylation’) to become the active chemical (‘metabolite’). This is essential for the calcium metabolism in the body for healthy bones. Research has indicated that Vitamin D could also be important to maintain healthy brain functions. Vitamin D receptors and the hydroxylation enzymes (responsible for hydroxylation of inactive Vitamin D to change this to the active metabolite) have been found on different parts of the brain. Studies have indicated an association between Vitamin D deficiency and mental health symptoms (such as depression, anxiety, and cognitive brain function). Amino acids are essential for the synthesis of neurotransmitters in the brain and nervous system. The requirement of amino acids increases during pregnancy. The essential amino acids are required to come from the diet as the body cannot synthesise them. Healthy protein intake can ensure an adequate supply of amino acids. Omega-3 fatty acids are a type of polyunsaturated fatty acids (PUFA). In a different note, the other variety of PUFA is Omega-6 fatty acids. The omega-3 PUFA are essential fatty acids, i.e., they can not be synthesised in the human body. Therefore, they need to come from food. They are found in a variety of seafood, such as fish (salmon, tuna, sardines, cod, and anchovy) and algae. The other sources are vegetable oils, flax seeds, walnuts, and some types of vegetables. They are vital for the baby’s brain and retinal development during pregnancy. At the same time, omega 3 Fatty Acids are important for healthy brain function and prevention of perinatal depression. How Omega-3 fatty acids reduce the risk of depression/ mental health condition? Inflammation is now thought to an important pathway for depression and other mental health conditions. The omega-3 fatty acids undergo some changes (‘esterification’) within the outer membranes of the nerve cells of the brain. After the esterification, the PUFAs change into phospholipids within the cell membrane. These phospholipids ensure the healthy function (‘fluidity’) of the cell membranes (11) and prevent the abnormal signals from entering the nerve cells (through ‘ion channel modulation’ (12), and ‘receptor mediation’ (13). Is the requirement of omega-3 PUFA high during pregnancy? The daily requirements of omega-3 PUFA increase in pregnancy. As they can not be synthesised in the body, they need to be taken in adequate amount in the diet to prevent deficiency during pregnancy. Wome with omega-3 fatty acids can develop depression. It is recommended that pregnant women should take at least 200 mg of DHA every day. 1 to 2 servings of seafood per week is enough to achieve this. They could be harmful to the developing fetus. Therefore, it is recommended that the pregnant women should not take more than 2 servings of fish per week. This is equivalent to about 340 g or 12 oz of seafood per week. Why are women prone to develop nutritional deficiency during pregnancy? A) High physiological demand: there is an increased requirement of the nutrition due to the need for the growing fetus and the physiological changes in the body (such as increased blood volume, growing uterus, and raised basal metabolic function). 1. Nausea and vomiting in pregnancy/ hyperemesis gravidarum. C) Less availability of food due to poverty/ poor socio-economic conditions in many families around the world. Why avoid excess food consumption during pregnancy? The science and the traditional belief of the society often clash when it comes to eating during pregnancy. Pregnancy is often seen as a time to let loose healthy dietary habits, with an intention to ‘eating for two’. Women are often encouraged to allow weight gain freely. Sometimes, excess food intake is a coping mechanism during stress. Although the nutritional requirement increases during pregnancy, care has to be taken to avoid excessive weight gain during pregnancy. Excess Gestational Weight Gain (GWG) could be detrimental to the health of the pregnant woman. This could increase the risk of gestational diabetes, preeclampsia, and venous thromboembolism. Therefore, eating adequate (but healthy) food and exercise during pregnancy are important. Can cultural factors play any role in the nutrition during pregnancy? In many parts of the world, many pregnant women do not get adequate nutrition due to poverty. Moreover, cultural beliefs and rituals play an important role in the food intake during pregnancy. Cultural practices, values, and beliefs should be taken into account while advising pregnant women regarding food and nutrition. Is consuming junk food safe during pregnancy? The intake of junk/ fast food is increasing all over the world. This has now become a part of the busy lifestyle. These are often convenient, highly palatable and readily available, especially with the current era of Internet and food Apps in mobile devices. Advertising also plays a role in its popularity. It is likely that the consumption of the fast food is also increasing in pregnant women. This trend is concerning as such food usually contain processed meat products, refined cereals, sweet drinks, and salty snacks. They all could be health hazards (such as Type 2 diabetes, obesity, hypertension, abnormal lipid profile, and heart disease) if consumed in high quantity and for a long time. Moreover, the nutritional values are often lost in the processing and often, artificial coloring and preservatives are added too. Research is emerging to show that fast food intake during pregnancy can influence fetal programming. They also are at high risk of gain more weight during pregnancy with relevant consequences. Unhealthy food consumption has been linked to more stress symptoms and depression. Therefore, fast food is likely to have an impact on the mood and brain functions. However, more research is required to explore the impact of fast food on maternal mental health. Therefore, it is advisable to avoid/ minimise the intake of fast food for a healthy lifestyle during pregnancy and beyond. Can dietary interventions be helpful in the prevention and treatment of perinatal mental health conditions? Some research has indicated that nutritional deficiency can increase the risk of depression both during pregnancy and postpartum. Further research is required in this field to establish if any specific diet/ nutritional supplement can prevent/ treat mental health conditions during pregnancy/ postpartum. This could be a noninvasive and cost-effective intervention option for treatment. 8. Institute of Medicine, and National Academy of Sciences USA. Dietary reference intakes for folate, thiamin, riboflavin, niacin, vitamin B12, panthothenic acid, biotin, and choline. National Academy Press; Washington DC: 1998. pp. 402–4. 17. Arzoaquoi SK, Essuman EE, Gbagbo RY, Tenkorang EY, Soyiri I, Laar AK. Motivations for food prohibitions during pregnancy and their enforcement mechanisms in a rural Ghanaian district. J Ethnobiol Ethnomed. 2015;11:59.